If Presenter view appears on the wrong screen, you can swap the display quickly. Turn off Presenter view if you prefer not to use it. On the Slide Show tab, in the Start Slide Show group, select From Beginning. Now, if you are working with PowerPoint on a single monitor and you want to display Presenter view, in Slide Show view, on the control bar at the bottom left, select , and then Show Presenter View. To move to the previous or next slide, select Previous or Next. To view all the slides in your presentation, select See all slides. Tip: You’ll see thumbnails of all the slides in your presentation (as shown below), making it easy to jump to a specific slide in the show. To view a detail in your slide up close, select Zoom into slide, and then point to the part you want to see. For more details on zooming in, see Zoom in to part of a slide. To point to or write on your slides as you present, select Pen and laser pointer tools. Press the Esc key when you want to turn off the pen, laser pointer, or highlighter. 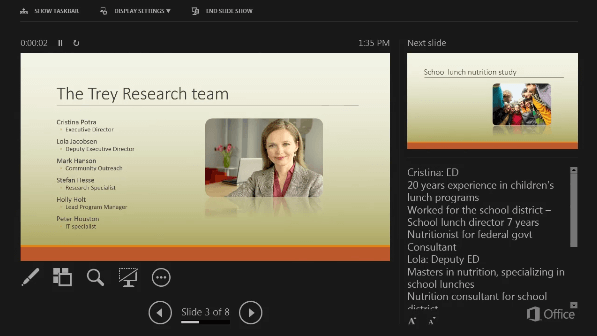 To hide or unhide the current slide in your presentation, select Black or unblack slide show. To manually determine which screen shows your notes in Presenter view and which shows only the slides themselves, on the task bar at the top of Presenter view, select Display Settings, and then select Swap Presenter View and Slide Show. When your computer is connected to a projector and you start the slide show , Presenter View appears on your computer's screen, while only the slides appear on the projector screen. In Presenter view, you can see your notes as you present, while the audience sees only your slides. To change the size of the panes in Presenter View, point your mouse at the vertical line that separates them, then click and drag. On the Slide Show tab of the ribbon, clear the check box named Use Presenter View.